When I was hired as a traveling campaign coordinator for Vegan Outreach (VO), I immediately knew that pretty much everything about my stationary life in beautiful Boulder, Colorado, was going to change. I knew that I would no longer wake up and go about my day with the comfort of knowing my immediate environment or seeing familiar faces on a regular basis. I knew I wouldn’t come home to the same bed every night or even drink my preferred flavor of coffee in the mornings. Looking at the bigger picture, though, I knew that the daily routines and overall predictability of my life was going to be a small sacrifice given the journey and adventures that lay ahead. And honestly, as I sit here today, two months into my new nomadic lifestyle, I can wholeheartedly say that the joy my job brings me far outweighs the lack of predictability. All that said, there are a few activities I did pre-VO life that I sometimes feel nostalgic about, and cooking is one of those activities. I have gone from a kitchen pantry full of containers of bulk grains, beans, and spices and a fridge filled with an array of colored veggies and fruit to a medium-sized cardboard box filled with dried fruit, nuts, granola, a rather impressive selection of energy bars, and few jars of peanut butter in various flavors. Oh, and I do have a rather nifty car cooler that plugs into my cigarette lighter to stay cold. I use it to carry apples, bananas, pears, oranges, raw veggies, and hummus. My extent of food preparation has gone from using five- to 10-ingredient recipes and mixing machines and utensils to either grabbing a vegan meal replacement bar, handfuls of dried figs, banana chips, almonds, and a piece of fresh fruit—or getting really fancy and whipping out my reusable three-in-one knife, spoon, and fork and slapping a heaping scoop of peanut butter onto a banana (this is my personal fave!). 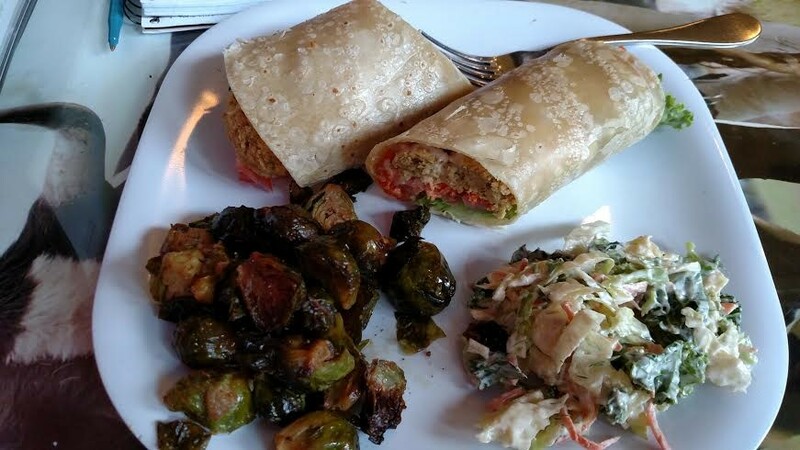 This was a meal I got from an all-vegan café in upstate New York called Karma Road Organic Café. The café had an extensive menu, including breakfast items, sandwiches and wraps, salads, desserts, coffee, and smoothies. The restaurant also had a deli counter with ready-to-eat dishes, including veggie burgers, three-grain pizza, curry, chili, blackened tofu, sweet potato biscuits, and more! I had a hard time deciding whether to order off the menu or try the dishes at the deli. In the end, I couldn’t make up my mind. So I did both. I ordered a falafel wrap (with grated carrots, tomato, lettuce, and tahini), with sides of roasted Brussels sprouts and broccoli slaw. The picture speaks for itself: delicious! An all-vegan pizza café? What?! 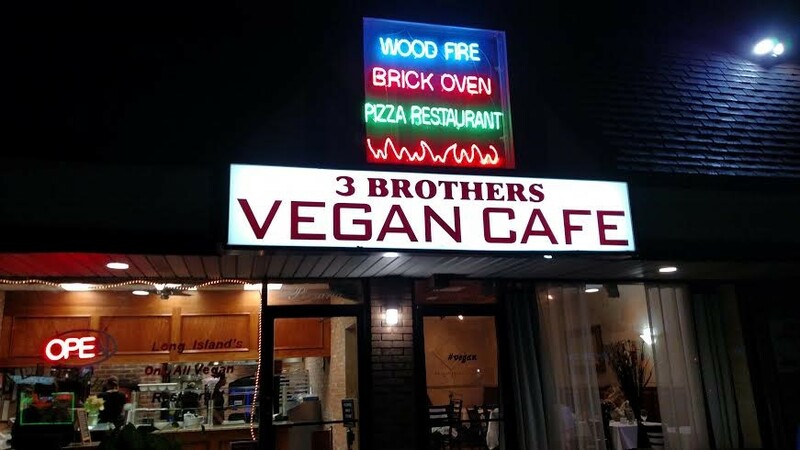 3 Brothers Vegan Café was a restaurant I ate at when I was leafleting in Long Island. This place had an almost overwhelmingly huge menu, which included appetizers, pizzas, calzones, pasta dishes, salads, sandwiches, burgers, paninis, special entrées, and desserts. Four of us ate together at the restaurant, so I, fortunately, got to take bites of everyone’s appetizer and main dish. 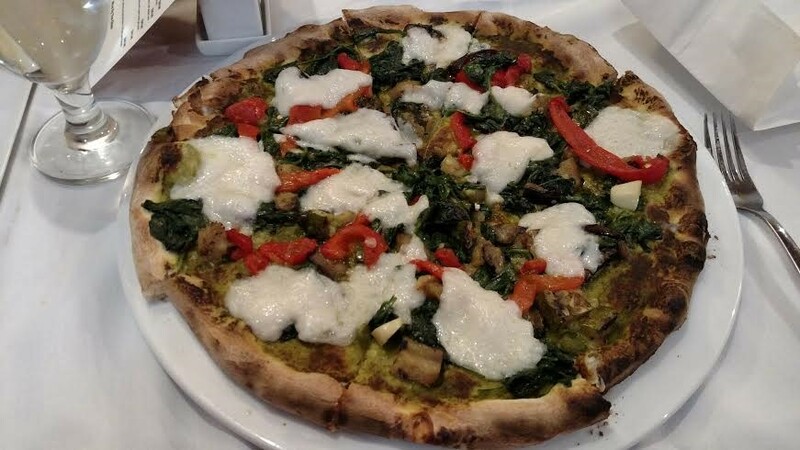 I was the only one who ended up ordering a pizza (pictured above); I got the Verdue Pizza, which was topped with grilled zucchini, grilled eggplant, spinach, olives, roasted peppers, basil pesto, and cashew milk mozzarella. I will probably never order a pizza this good again (until I return to 3 Brothers, that is). Since I was on Long Island for a number of days, my host suggested we also try House of Dosas. 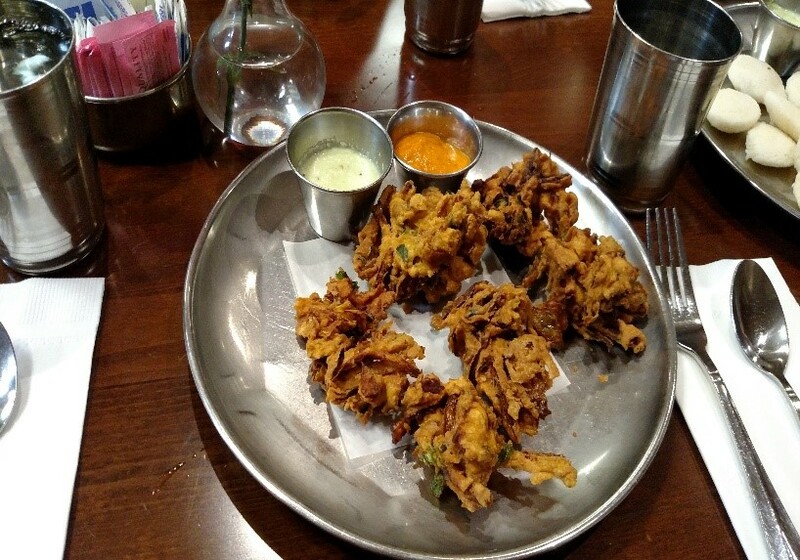 This restaurant was not 100 percent vegan; it wasn’t even vegetarian (like many Indian cuisine restaurants are). It did, however, have a number of items on its menu that were vegan or that could be “veganized” by simply requesting that the dairy products be left out (cream, butter, yogurt, etc.). Once again, I ate at the restaurant with a number of people, so I got to sample a lot of the dishes and appetizers. 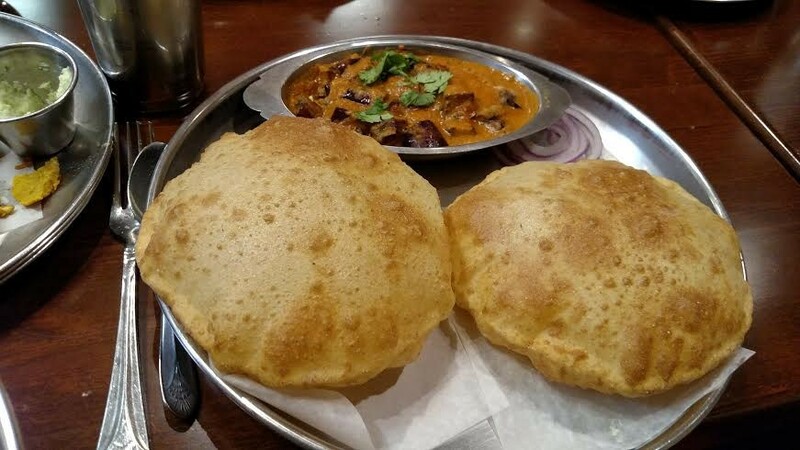 I ordered the eggplant curry (confession: I am obsessed with curry and eggplant, so I was delighted to see the two together as a main entrée), which could be served with basmati rice, roti (a type of Indian flatbread), or puri (unleavened fried bread). I had never tried puri, so I decided to order that alongside my curry. I will be honest—the bread wasn’t anything to write home about. Although, I found them to be aesthetically pleasing if nothing else! If I were to come across this dish again, I would probably order the basmati rice. 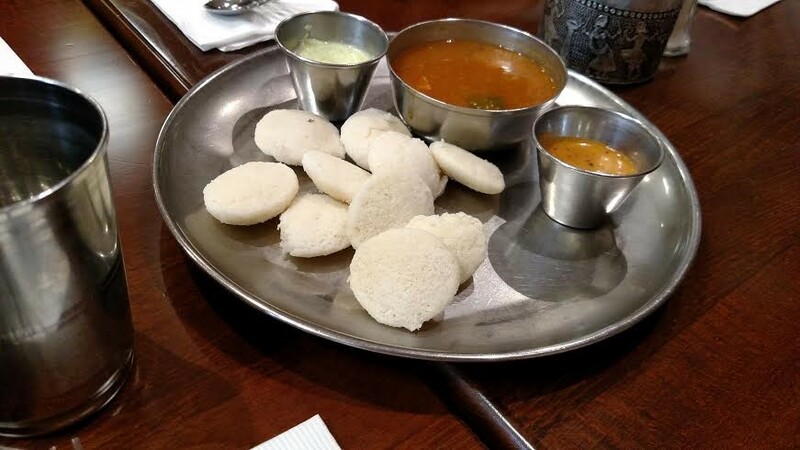 Nonetheless, the curry was excellent, as were the appetizers that my friends ordered: idly steamed rice and lentil patties (second picture), and cutlet, minced vegetables with spices, crumbled and fried (third picture). Life on the road has been anything but tasteless, believe me. And even if I’d rather be on the preparing and cooking side of a yummy vegan meal, I cannot complain. The trade-off of trying out different vegan dishes is almost as good! Thus concludes my vegan food adventures for today, but stay tuned because I have decided I would like to start regularly writing about my life on the road. I will continue to write about my vegan food encounters, but I will also be writing about several other wide-ranging topics, including humorous events that have happened and the types of activities I do when I am not leafleting. I am beyond excited to start this, shall we call it, series, as I would love nothing more than to openly share details about the job I feel incredibly fortunate to have. Lori, you are such a force for good and I feel honored and lucky to work with you! Big thank you to you for writing this and to the donors and hosts who make this work (and eating!) possible.